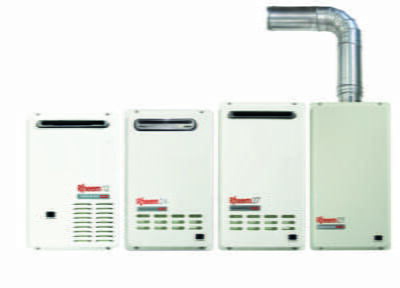 Australian Hot Water can service, repair, supply and install a wide range of gas hot water heater types from Australia’s leading brands, such as storage mains pressure and continuous flow instantaneous. Serving you from locations throughout Sydney, Canberra and Newcastle. For reliable advice on the best gas hot water system for your needs and budget, installed with ease by our fully authorised team, contact Australian Hot Water. We know that effective and energy efficient water heating is a priority for you. To help you choose the right gas hot water system for your needs, Australian Hot Water supply and install products from all of the leading water heater manufacturers. We can help you choose the right system to fit your requirements and budget. Australian Hot Water supplies and installs a wide range of gas hot water systems from all the leading manufacturers. An important consideration with gas hot water systems is their energy rating. All gas hot water heaters have an energy-rating label and more stars means more energy efficiency. Gas hot water systems are a great choice for energy conscious customers. They produce less greenhouse gases than electric heaters and are often cheaper to run. Gas storage systems also have faster heat recovery times and require a smaller storage tank as gas is available 24 hours a day. However, a natural gas supply is required as bottled LPG can be at a higher running cost and requires self-monitoring to ensure not to run out of gas at crucial times. Some natural gas and LPG installation costs can be slightly higher than electric hot water systems due to larger pipe sizing or regulator setups. Australian Hot Water have the nation’s leading water heating sales and repair team, meaning that we know how to fix or install the hot water system which is perfect for you and your family’s needs before winter rolls around. The first choice you’ll need to make is whether to install a gas or electric hot water system. There’s no correct answer to the electric versus gas hot water system debate. Instead, it will depend on your hot water needs, your location and your other priorities, such as desired electricity usage and environmental impact. This page has everything you need to know about gas water heaters and more. What is a gas hot water system? As you might have guessed, a gas hot water system is a water heating system where the main fuel used is natural gas. Hot water systems that use gas haven’t been as common in Australia traditionally as the humble electric tank, although that is starting to change as the gas grid has expanded and modern style electronic ignition continuous flow water heaters that have features like touch pad tempreture control have now evolved . The most common preferred type of gas water heater is the tankless heating system, or also be known as a continuous flow . Although there are also a variety which do include a storage tank and have 5 star efficiency . Many will require you to be connected to the natural gas line, although there are plenty of options that can be plumbed to LPG bottled gas if there is no natural gas in your area. Each system has a range of advantages and disadvantages, so it’s best to know which one will be the right one for you. Gas hot water systems tend to be more efficient than electric hot water systems, while they also produce significantly fewer greenhouse gas emissions. Gas continuous flow hot water systems are known to be more immediate and sustainable than some electric hot water systems as there’s no need to rely on a tank to store your hot water, however they do not work during power outages. These days however there have been a number of advances in electric water heating technology, with a variety of improved continuous electric hot water systems on the market. Another advantage of gas hot water systems is that - unlike electricity - there are no time of day tariffs for using gas, meaning that it’ll cost you the same no matter when you want to take that shower or run the bath. To find out the right water heating system for you, get in touch with Australian Hot Water today. Australian Hot Water is the largest specialist hot water franchise in Australia, with service centres and showrooms in Alexandria, Belmore, Caringbah, Eastwood, Leumeah, Moorebank, Mona Vale, Seven Hills, Fyshwick in Canberra, and Cardiff in Newcastle. We also have licensed agents in Melbourne, Gold Coast and Adelaide. We provide a same day service for the repair and replacement of gas hot water systems. With over 30 years’ experience, you can be confident that our authorised service representatives can service and repair your hot water system – even if it has long been out of production. We are certified service agents for all the top manufacturers including Rheem, Rinnai, Beasley, Vulcan, Dux, Bosch, Stiebel Eltron, AquaMAX, Edwards, Zip, Hocking and Solahart. To book a same day service call, phone Australian Hot Water now.